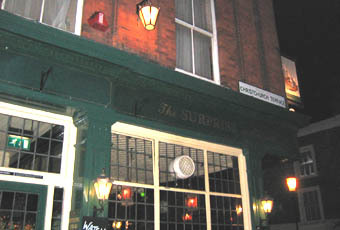 The Surprise is that a pub can still survive in a backstreet Chelsea location like this. Since its original incarnation, it has adapted more to suit the local denizens and is more of a gastropub or a restaurant that serves ales. Nevertheless, I didn't feel too uncomfortable on my Saturday morning visit. Ales on were Sharps Own & HMS Surprise, Youngs Gold & Windsor and Eton Knight of the Garter. I seem to recall that the cider was Aspalls. Service was fine. The Surprise has finally opened after years of being closed. It has probably the prettiest head bar girl in the country, but besides staring at her, the service is appalling. On Friday night they had two rather slow bar staff in a packed pub making one wait over 20 minutes for a drink. Preference goes to regulars i.e they are served well before you and there is very little outside space. As my brother would say - "a very dishonest pub." It's good to find this traditional Chelsea pub open again. It's a touch on the trendy side for some tastes but it has a pleasant atmosphere and some good beers. The Windsor & Eton Star and Garter was brilliant---served in old-fashioned dimple glasses as well.. Menu and food excellent, decor rather generic, service terrible - when they brought the food the waitress anounced that one of the choices was no longer available - didn't mention this when we ordered. She then said the kitchens were closing so we couldn't order anything else. We kicked up a fuss and then miraculously they produced what we had originally ordered. They also play loud and souless piped musac. Would go again if they sorted these thing out. This pub has recently re-opened following a complete refurbishment. It is eveything a Chelsea pub should be.